UPDATED: Fri., March 2, 2018, 5:08 p.m.
LAS VEGAS – There were several worthy contenders, but Jessie Loera probably had Gonzaga’s best stat line in Friday’s West Coast Conference Tournament win over Pepperdine. With the Bulldogs, there are always plenty of contenders for that designation. Top-seeded Gonzaga’s versatility was on full display again with six players grabbing at least three rebounds, three dishing out at least four assists and seven scoring at least six points. Loera went for 13 points, six assists and four boards. The 5-foot-6, backup point guard also swatted two shots and had a steal. Loera had five of her six assists in 10 first-half minutes. In the third quarter, she blew past defenders for two consecutive layups and a trip to the free-throw line. She knocked down 3 of 4 3-point attempts as the Zags hit 9 of 20 overall. 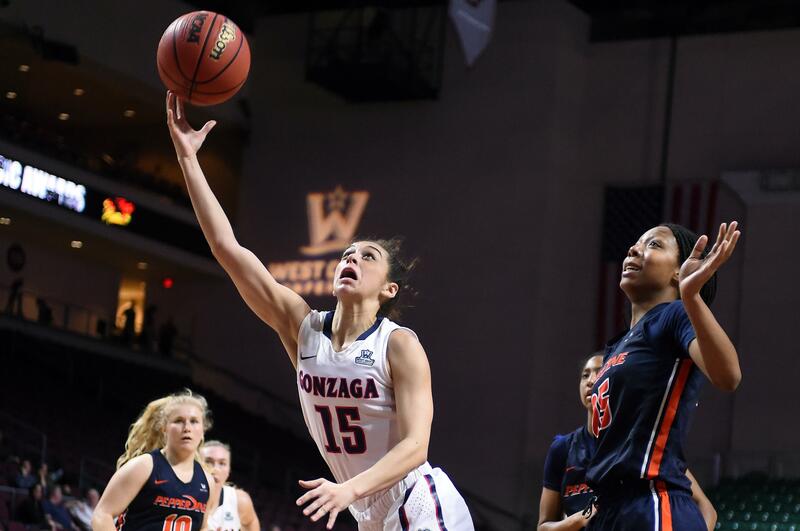 WCC Player of the Year Jill Barta had another one of her mesmerizing scoring flurries, popping in three 3-pointers, layups and nailing shots everywhere in between. At one point, she scored 19 points in 11 minutes. Barta is one large piece of the puzzle for opposing defenses. For example, Chandler Smith. The junior guard couldn’t get her 3-point shot to drop, but she hit a pair of jumpers on feeds from Loera and finished with team-highs in assists (seven) and rebounds (seven). Gonzaga’s bench scored 31 points. Freshmen twins LeeAnne and Jenn Wirth combined for 13 points. The 6-3 LeeAnne stepped out and drained a 3-pointer. “We have great talent around our best player (Barta), players that can do a variety of things,” Fortier said. “Chandler’s biggest strength is probably her passing, and we’re asking her to shoot the 3 and she has, and asking her to rebound and shoot the midrange jumper. That versatility tends to fill up multiple columns on the stat sheet. Published: March 2, 2018, 4:15 p.m. Updated: March 2, 2018, 5:08 p.m.